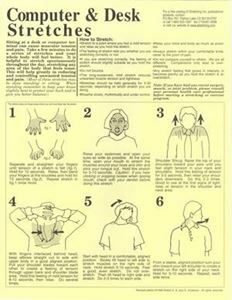 COMPUTER & DESK STRETCHES chart in reduced form for handouts to office workers, clients of massage therapists, physical therapists, doctors. Excellent aid to learning how to stretch. Something they can take home with them. 8 1/2 " x 11" pad of 40 identical sheets. Quantity discount: 5-10 @ $4.80/pad, 11-20 @ $4.30/pad, 21+ $4.00/pad. If you want to preview this item, we can fax or email you an example for review.